Apple has just released the final version of iPhone OS 3.2, along with SDK for iPad. This final version of iPhone OS 3.2 and SDK for iPad has been released only a few days before the first batch of iPad pre-orders ships this coming weekend on April 3rd. The last Beta 5 was released on March 18th, and Beta 4 was released earlier this same month. This is an iPad only release. Members enrolled in the iPhone Developer Standard or Enterprise Program can access these bits of iPhone OS 3.2 for iPad by signing into Apple Developer Connection. Beta 3 of the SDK was released last month on February 24th, Beta 2 was released on February 10th, while the first Beta was released back in January when iPad was first officially announced by Apple. UPDATE 2: iTunes 9.1 is here! Brings Support for iPad ! More info here. UPDATE 3: Download iPhone OS 4 Beta Developers Preview for iPhone and iPod touch. More info can be found here. UPDATE 4: Jailbreak iPad with Blackra1n is confirmed by Geohot! More info here. This Means they can release the jailbreak now, right? this is just for ipad or for iphone 3g,3gs too? This FW is only for the iPad and it won't work on the iPhone. Sry guys. So there won't be any jailbreak now, until they release the 3.2 firmware for the iPhone. I hope this will happen on April 3rd when the iPad is released officially. 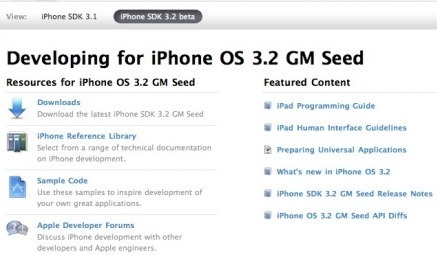 when os 4.0 for iphone 3gs release? Anyone know where i can find the 3.2 firmware? i cant find it anywhere. how do you restore ipad from 3.2.1 to 3.2 ?? So just bought another iPad it came preinstalled with 3.2.2 can I use this method to downgrade it?